I had been growing them for, oh, three years or so before it struck me just how early the fruit appears. Yes, if you are “playing along,” the answer to my question, “Can you guess what this is,” is… grapes. 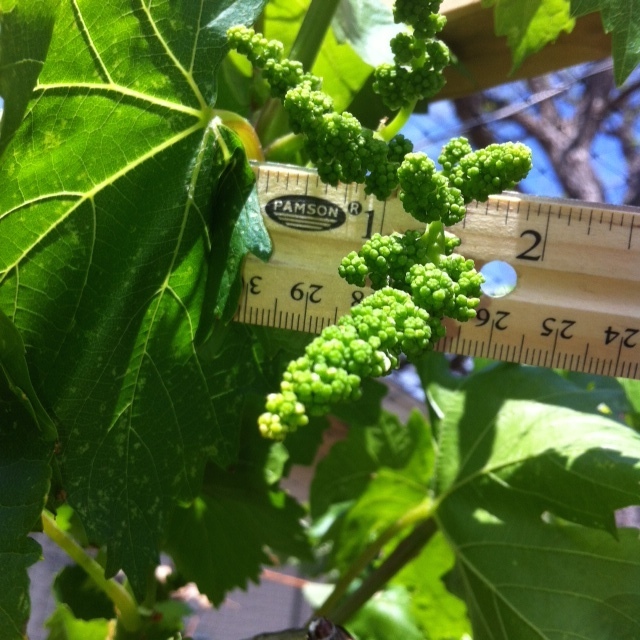 The accompanying photo shows a grape cluster as it looks only a few weeks after the first leaves appeared on the vine. I shot this image today, April 10, 2014. Ten days or two weeks ago the individual grapes were super-tiny–like about the size of sesame seeds or something like that. They seem to come out just days after the leaves appear. When I first started growing grapes, I would look for some kind of little flowers or something like that to appear first, before the clusters, but I’ve given that up… if there are any signs earlier than the little clusters themselves, I don’t know what they are. Grapes will not grow on just any branch of the vine. They only appear on branches that appeared last year. These branches – this “wood” – is called the “fruiting wood.” If a branch is in its third season, it is no longer “fruiting wood” and it will no longer produce grapes. And certainly the main vine or trunk will not. The vine nourishes the branches, and hence in an indirect sense the vine “grows” not just the branches but the fruit that is on the branches, but only indirectly and only through the branches. So it should be seen that the vine does not “initiate” the fruit that appears on the branches. Only the branches themselves initiate this phase. There’s an interesting passage in the Bible that parallels this kind of trait that grape vines have. Jesus said, “Abide in Me and I in you. As the branch cannot bear fruit of itself, unless it abides in the vine, neither can you, unless you abide in Me. I am the vine, you are the branches. He who abides in Me, and I in him, bears much fruit; for without Me you can do nothing….” (John 15: 4-5). Jesus decided, very deliberately and purposefully, to leave the task of “bearing fruit” to those who are His own. Today, the only ones who will produce fruit (and by “producing fruit” we are talking about bringing people to the truth, and saving souls for eternity) are human beings. Not angels, not the Holy Spirit, not even Jesus Himself. Yes, Jesus enters into a life when a person becomes a child of God through baptism. And Jesus “nourishes” that individual. But the task of reaching out to other individuals and sharing the truth with them, and pointing them toward becoming a child of God–that task has been assigned and relegated to those individuals who have become children of God, and no one else carries this obligation nor even can carry this obligation. This principle is known as the “doctrine of earthen vessels,” and it is best understood if we examine chapters 8, 9, and 10 of the Book of Acts. I have a study I have posted elsewhere on this site, and it will explain to anyone, in just a very few pages, how the “doctrine of earthen vessels” is to be understood and why it is a directive from Christ Himself. You’ll find it here. There’s more to this business of Jesus taking Himself and His heavenly hosts out of the activity of spreading His life to the world, and these understandings are badly lacking in the Christian world, the church world, today. My book Rightly Divided covers much of this ground, and I also recommend it to those who might be interested. You can get a good taste of what the book is about at this page. Thanks for reading! Feel free to share this post via the sharebar that tracks along on the side of this post, or via sharing my URL as a link. May we all be better fruit-bearers for the true vine, Jesus Christ.